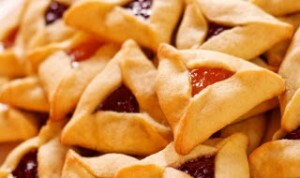 Purim – the feast of lots – is this Wednesday night and Thursday. Preserved in the Book of Esther, Purim is a story of God’s deliverance celebrated with merriment and good food. 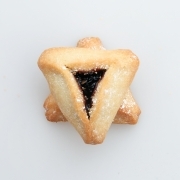 So here is our Hamentaschen recipe, so you can enjoy it too! Mix flour, sugar and baking powder in large bowl. Cut in butter, using pastry blender or crisscrossing 2 knives, until mixture resembles fine crumbs. Mix lemon peel, vanilla extract and eggs. Stir into flour mixture until dough forms a ball. (Use hands to mix all ingredients if necessary; add up to 1/4 cup additional flour if dough is too sticky to handle.) Cover and refrigerate about 2 hours or until firm. Roll half of dough at a time 1/8 inch thick on lightly floured cloth-covered surface. Cut into 3-inch rounds. Spoon 1 level teaspoon filling onto each round. Bring up 3 sides, using metal spatula to lift, to form triangle around filling. Pinch edges together firmly. Place about 2 inches apart on ungreased cookie sheet. Bake 12 to 15 minutes or until light brown. Immediately remove from cookie sheet to wire rack. https://www.chosenpeople.org.uk/wp-content/uploads/2017/12/CPM-UK-Logo-300x50.png 0 0 N Cooke https://www.chosenpeople.org.uk/wp-content/uploads/2017/12/CPM-UK-Logo-300x50.png N Cooke2015-03-01 19:01:292017-06-16 12:52:07Enjoy Hamentashen!